After over 4 months of work, we are excited to announce the launch of HDSLR 101, a complete training guide for people new to DSLR video. Whether you have shot stills for years and are new to video, or have been shooting video for years and have never picked up a DSLR…we will cover all the basics of DSLR video workflow. 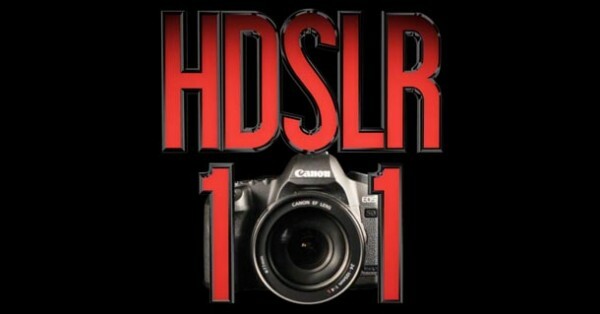 We will be releasing HDSLR 101 every 2 weeks for the next 6 months for a total of 12 episodes and over 2 hours of training. For those who don’t want to wait that long, they can download the entire HDSLR 101 series on our Store site for only $19.99. Not only does this help support our continued training resources, but you will also have access to a special BONUS episode. In Episode 1 of HDSLR 101, we discuss how DSLRs first got video, sensor sizes and how they affect the look of video, and the pros and cons of shooting video on HDSLRs. Nice series. I’m looking forward to the next episodes. Forgive my perfectionism but I do have a small correction. In HDSLR 101 #1 you said that a larger sensor gives you lower light sensitivity. I think you combined two ideas and meant to say that a larger sensor gives you higher light sensitivity allowing you to shoot in lower light environments. You might also producing a transcript of these classes. You can find transcription services that cost about a dollar per minute so this episode would cost about $20. This would make the entire series searchable reference. If you include time-code with it then it could be even more useful. Yeah, I always have a hard time vocalizing that feature. My point was that the sensor has better sensitivity in lower light conditions. Thanks for the transcript link. We’ll have to look into that.